Peri is also a Research Associate of the National Bureau of Economic Research, a CESifo Research Fellow, a CReAM External Fellow and member of the editorial board in the Journal of Urban Economics, Journal of Population Economics and Regional Science and Urban Economics. Prior to coming to UC Davis, he visited the European University Institute as the Jean Monnet Fellow in 2000-01 and taught at UCLA Economics Department as a Global Fellow in 2004-05. 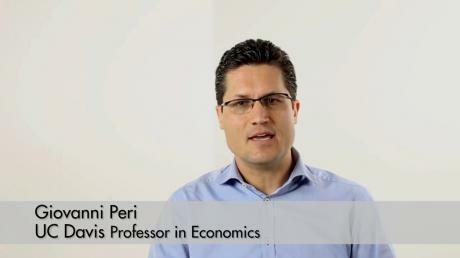 During the academic year 2010-11, he was a visiting research professor in Bocconi University, Milano. If US presidential candidate Donald Trump wants an immigration system that works for Americans, he might want to consider one with far fewer restrictions than he’s proposing. Immigrants don’t cause high unemployment. In fact, a century of data suggests Trump has both his chronology and his causation reversed—it shows that a thriving US job market causes immigration to rise. Immigrants, Poverty and Welfare: How Do They Fare, and How Do They Affect Natives? 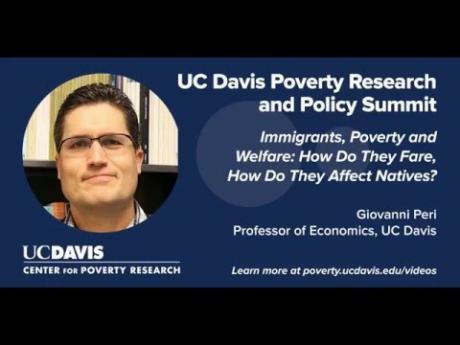 This presentation features UC Davis economist Giovanni Peri discussing why immigrants from Mexico and Central America are more reliant on wages and less reliant on public safety net programs, yet are still much more likely to be poor than those born in the US. nald Trump’s economic message is loud and clear: Misguided Washington policymakers have allowed foreign countries to steal American jobs, and uncontrolled immigration is driving wages down. Capping the number of visas issued to foreign-born tech workers restricts the number of U.S-born workers that firms could hire – and the Bay Area is feeling the brunt of that impact, according to a new study. “As the company becomes more productive because of the contributions of these (foreign-born) people and grows, then it will demand more workers – workers who are there (in the U.S.) will participate in the growth of the company,” Peri said Thursday. DAVIS, Calif. — Center for Poverty Research faculty affiliates have launched three major projects funded by the 2013 UC Davis Interdisciplinary Frontiers in the Humanities and Arts (IFHA) grants competition. These three projects won more than $1.3 million in the funding this past June to support interdisciplinary research projects led by Center for Poverty Research director Ann Huff Stevens, deputy director Marianne Page, and faculty affiliate Giovanni Peri. Research Affiliate Giovanni Peri has proposed a new immigration permit system that would replace the current waiting list and lottery with a work permit auction. The new approach is based on Peri’s economic research that found that immigration often helps native-born workers in the U.S. by raising overall productivity. The effects of immigration on low-skilled native workers in the U.S. is both an active area of research among academics and a critical component of policy discussions of the costs and benefits of immigration policies. In a new study, Research Affiliate Giovanni Peri quantifies the effects of immigration on wages and poverty rates of native workers in the U.S. over the past two decades.